Bloodstock give us an early Christmas present of more bands! James December 6, 2016 News No Comments on Bloodstock give us an early Christmas present of more bands! As we pelt into December, Bloodstock HQ is getting some Christmas treats ready! As well as preparing the on-sale dates of VIP upgrades, the remainder of the VIP ticket allocation and this year’s deposit scheme, they’ve anounced three more bands for 2017! Joining the BOA fray for the first time are Skindred. The boisterous Welsh crew mix a unique blend of reggae, punk and metal and are renowned for their live shows. If you’ve ever taken part in Evil Scarecrow’s epic “Crabulon” before, get ready to join in with the “Newport Helicopter”! Check out the video for “Sound The Siren” from their current album Volume, out now via Napalm Records. Also landing a main stage slot are Canadian thrash icons, Annihilator. Last year’s Suicide Society album – the band’s fifteenth! – spawned tour dates around the globe, but rumour has it they’re heading back to the studio this month! Check out Jeff Waters and his cohorts slaying through their classic track “Alison Hell” at Wacken 2015 and get a taster of what’s in store at Bloodstock here! Minus the mud, of course! Rounding out today’s announcement are our crossover thrash buddies, Municipal Waste! With last album The Fatal Feast coming out four years ago, maybe Bloodstock will get treated to a new tune or two?! Frontman Tony Foresta tells us “We are very excited to be finally returning to one of our favourite metal festivals – Bloodstock! We’re looking forward to getting greasy with all of our UK fans!” Meanwhile, check out the space-gore-tastic video to the title track here. 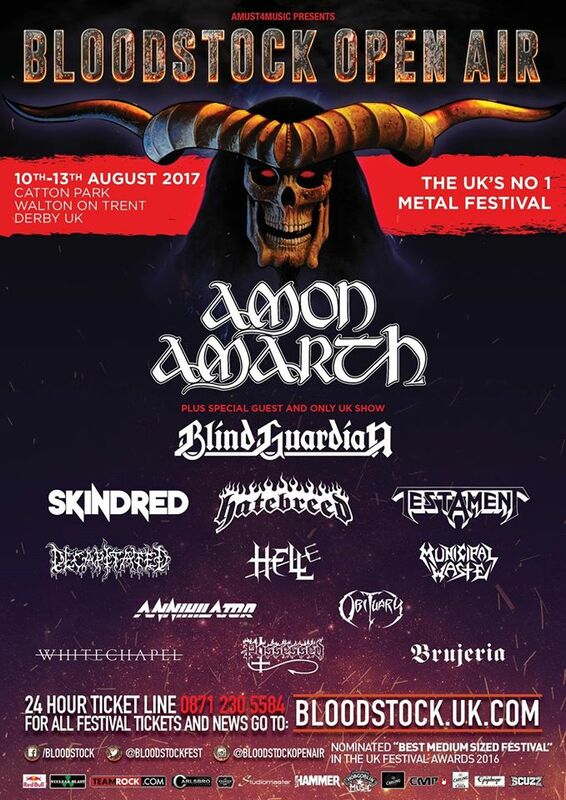 Already announced for 2017 are Friday’s headliners Amon Amarth, plus Blind Guardian, Hatebreed, Testament, Obituary, Brujeria, Whitechapel, Possessed, Hell and Decapitated. Many more are still to be announced! Early bird weekend camping tix are on sale at a discounted £120 and due to exceptional demand, a limited number of VIP packages were put on sale last month on a first come, first served basis. This allocation quickly SOLD OUT! The remaining VIP allocation and a number of VIP upgrades (to accompany previously purchased early bird tickets) and will be available from 16th December, but don’t hang around if you want these, as VIP is set to sell out even earlier in 2017. Also stay tuned for details of 2017’s ticket deposit scheme (payable over 5 instalments) in just a few weeks time! Bloodstock will take place at Catton Park, Derbyshire on 10th-13th August 2017. Early bird weekend tickets with camping are available now, priced from £120 (+ booking fee). Children’s weekend tickets are also available, priced £35 (+ booking fee). Camper van pitches have now SOLD OUT.